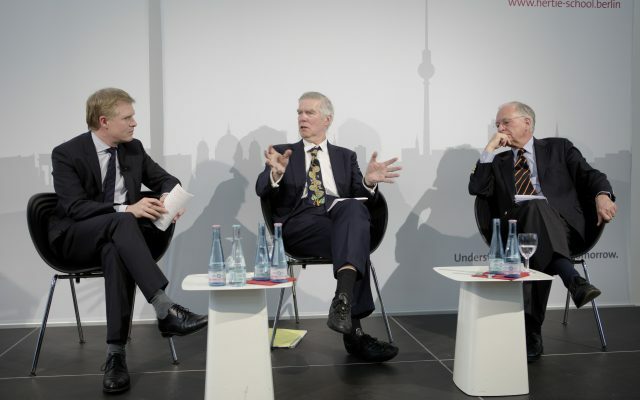 At our kick-off event on March 6 in Berlin, Robert Cooper and Wolfgang Ischinger discussed Europe’s future foreign policy challenges. Based on their extensive experience high-ranking diplomats, the two Dahrendorf senior fellows outlined potential scenarios for a successful Union approach. If any prediction is likely to hold true in 2015, it is that most predictions will fail. Ischinger, who chairs the Munich Security Conference, argued: “In conceptualizing the conference of February 2015, not one of the experts around me suggested that we should put either the potential rise of the Islamic State or the breakout of a Russia-Ukraine conflict on the agenda”. “We are facing a crisis of global collective decision-making, as it is evident in the inefficient operation of the UN Security Council, G8 and G20. There are more and more bodies with more participants, but ever less results and meaningful decisions”, Ischinger pointed out. Accordingly, national governments keep pretending that they are capable of delivering public goods like internal security and prosperity, while in reality they have long been overpowered by globalization. This, the diplomat cautions, has severely hampered the credibility of democratic actors. The two diplomats also made a few policy recommendations for the EU to navigate uncertainty more successfully in the future. Strengthen economic competitiveness: Ischinger criticized Europe’s ambiguous stance on a Free Trade Agreement with the United States. “We might soon face a situation where the U.S. is ratifying an arrangement with Asia, which might leave Europe on the losing side if it does not react.” He particularly stressed that Europe must remain competitive in a digitalizing world. Help Ukraine out of post-Soviet conditions: “If our objective was to help Ukraine out of post-Soviet conditions, that clearly did not work”, Ischinger stated. However, future policy efforts should always take Moscow into account: “Russia is deeply concerned that EU policies could work out well in Ukraine. Because if democracy and prosperity advance in Ukraine, Russians might demand the same kind of progress. Behind its assumed military strength, Russia is a terribly weak country. A 15 year old male Russian today has the same life expectancy as a 15-years-old in one of the world’s least developed countries”, Ischinger pointed out.